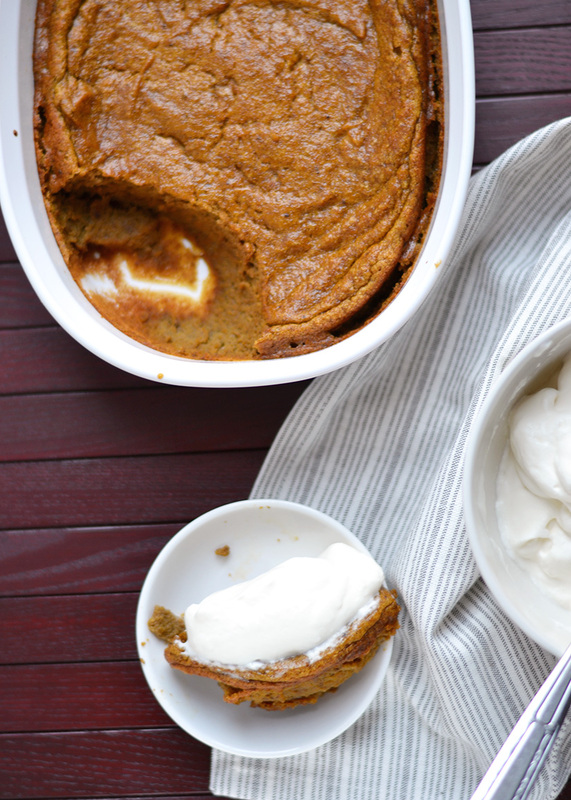 Baked Pumpkin Spice Pudding may seem like more of an afterthought than the perfect finish to a Thanksgiving meal. It’s not as sleek as the quintessential Pumpkin pie but it’s just as tasty and easier to make. Who needs that pesky, often soggy pie crust? Make the best of pumpkin pie by simply throwing the ingredients in a casserole dish and baking until set. The result is a pudding with the same spice and flavor of pumpkin pie, minus the crust. Add a dollop of whipped cream and this smooth creamy delight may not only make it on the dessert menu but on the breakfast menu too…and lunch…and afternoon snack. I love to peruse cookbooks and almost every time I open “The New York Times Cookbook” by Craig Claiborne, I find at least 2-3 recipes I didn’t notice previously and can’t wait to try. This classic book has many fall and holiday recipes. I probably won’t be able to make all of them this year but I couldn’t resist this baked pudding, or what I will now refer to as my new version of pumpkin pie (never had much luck making the pie version anyway). Fresh pumpkin and canned pumpkin usually seem interchangeable in baked goods. That statement may sound criminal but I usually don’t notice a huge difference in baked desserts (more so with soups and savories). 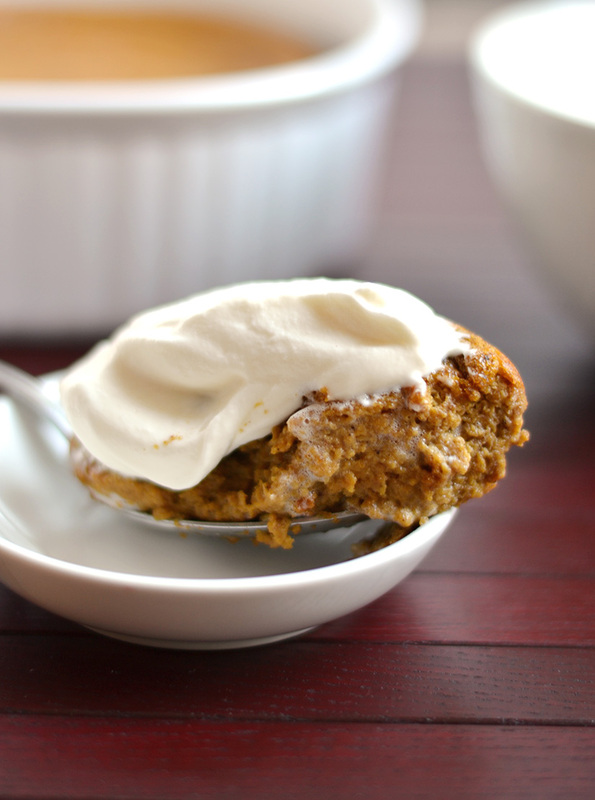 However, I prefer fresh pumpkin in this delicious Baked Pumpkin Spice Pudding with Whipped Cream recipe. Canned pumpkin is still tasty but Mr, Claiborne calls for fresh in his 1961 version and this classic pudding deserves it. So skip the pie this year and make this pumpkin pudding. Go ahead, eat it straight out of the casserole dish, I won’t tell. Peel the pumpkin, remove seeds, and cut into small pieces. Cook in boiling water until tender. Drain and mash thoroughly. Cool slightly. Preheat oven to 350 degrees. Lightly butter a soufflé dish. Beat the egg whites until thick stiff. Beat the egg yolks until thick and lemon colored. Combine the yolks with the pumpkin puree, half and half, rum, sugar, and seasonings. Mix thoroughly until blended. Fold in the beaten egg whites. Place the mixture in a buttered 1-quart soufflé dish. Set the dish in a pan of hot water and bake 40-45 minutes. Serve at once sweetened, topped with whipped cream. This was a fav. the whole family licked the bowl clean!! Thanks Kimberly! So glad you enjoyed it and sorry for the delayed reply!